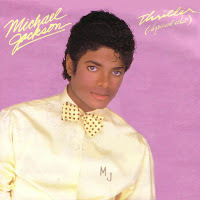 Michael Jackson died yesterday June 25th 2009. I can remember watching him perform at the Motown special and do the Moonwalk for the first time. The first record I ever owned was Thriller. His music was a major cornerstone of my childhood. My entire family are huge fans of Motown and I can remember jamming to the Jackson 5 with my brother. My mom still has the albums at her house. I am in shock along with the rest of the world. And I will mourn the loss of this musical prodigy. Last night Damon and I had a small dance party and I watched a bunch of his videos. I will introduce Sweet Pea to the magic of the man's music. I will leave you with Michael as I choose to remember him.